Tic Tac Toe is a classic game pretty much everyone is familiar with. You probably played it as a kid and maybe as an adult with a kid for fun. It is a simple game, but most people do not really put much deep thought into it. They just use their common sense to try to get 3 X's or 3 O's in a row while blocking their opponent from doing the same. I started thinking, with such a simple game, there are not that many combinations available. There had to be some logic behind it to determine what the best moves were. I decided to test it out logically to figure out the results of each type of move on the board. I determined that there were about 8 possible scenarios based on the first move from each player. You will see the examples below. Numbers 1-9 are used to show the sequence of moves. Odd numbers are the first player or "X". Even numbers are the 2nd player or "O". One observation to note is how the first player has 5 possible moves while the 2nd player has only 4 possible moves so the first player always has the advantage. 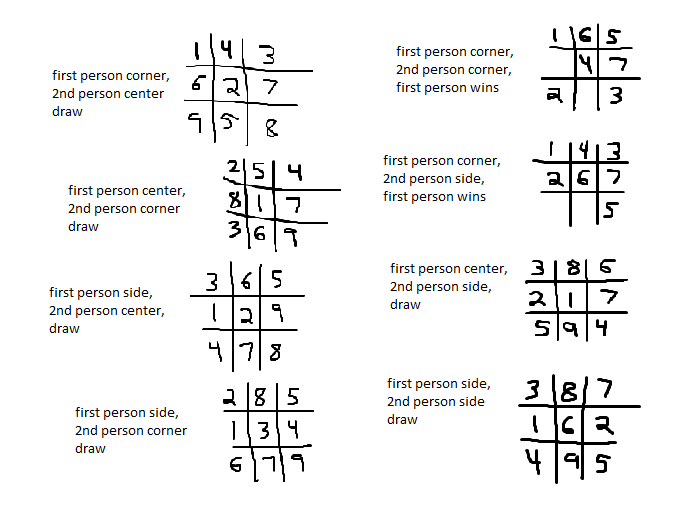 First person can win by picking corner if 2nd person then picks corner or side. 2nd person cannot win but can cause a draw by picking center if first person picks corner. Draws will result if first person picks side or center to start with. First person - Start with corner. 2nd person - Start with center. By following these tips you will be able to win or at very least not lose in the game of Tic Tac Toe.